Beets are divisive, I know. So if you’re not on Team Beet, better stop reading now. (Hey, try the gazpacho instead!) Me, I’ve loved beets since I was a kid; my late grandma had a photo of me eating a boiled red beet as though it was an apple, fuchsia war paint striped from ear to ear. But though my Pop-Pop grew plenty of beets in his garden, we never ate them as borscht. I had to wait until I was a post-college adult living in Chicago to discover my favorite vegetable in its perfect, chilled soup form. It was 2014-ish, and I had recently moved to Chicago’s Ukrainian Village, a gentrifying neighborhood of bicycle shops and cafes next to old-school delis and Eastern European travel agencies. Nearly across the street from my apartment was Kasia’s Deli, purveyor of borscht and frozen pierogi by the gross (yes, I at one point crammed 144 pierogi into my freezer). 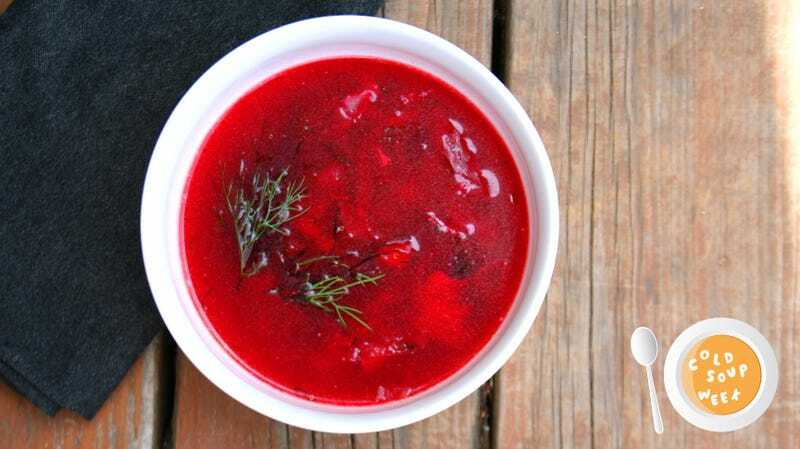 Kasia’s cold borscht was a revelation to me—earthy, lightly sweet, tangy, and faintly pickled. It was all the familiar flavors of Eastern European food, and prominently featuring my beloved beet. Why hadn’t anyone served me borscht sooner? Now that I have beets prime for pulling in my backyard garden—I hope Pop-Pop would be proud—I’m enjoying my own version of borscht. I didn’t realize what a great way this soup is to use up veggies we typically only think of in hot, winter Crock-Pot creations: turnips, rutabaga, celery, onions. You can throw some parsnips in there, I’m sure—carrots, too, if you want. But this combo of sweet beets and earthy rutabaga works great for me. Never thought beets could be called refreshing? Think again. In a stockpot, melt butter and add onions, shallot, and garlic. Stir and cook over medium heat until soft, about five minutes. Add a tablespoon of olive oil and the celery, turnip, rutabaga, and cabbage. Add broth and bay leaf; season with salt and pepper. Stir then cover, simmering over medium-low heat until vegetables are tender, about 10 minutes. Add grated beets. Simmer for another 15-20 minutes until all vegetables are tender. Remove from heat. Stir in dill and red wine vinegar; add more salt and pepper if needed. Store covered in the refrigerator until chilled; ladle soup into bowls and garnish with sour cream and more dill.